Enjoy our seasonal selection of cocktails we’ve paired with some of our favorite glassware! The first cocktail installment in our Spring Cocktail Series is this ruby red stunner. I’m all about margaritas – always on the rocks, no salt – but rarely deviate from the traditional. This grapefruit margarita adds a fun twist to the mix, without compromising the components of a traditional margarita that I love so much. The perfect balance of sweet and tart, it’s a refreshing drink for the warmer weather months, and one you’re sure to make time and again. 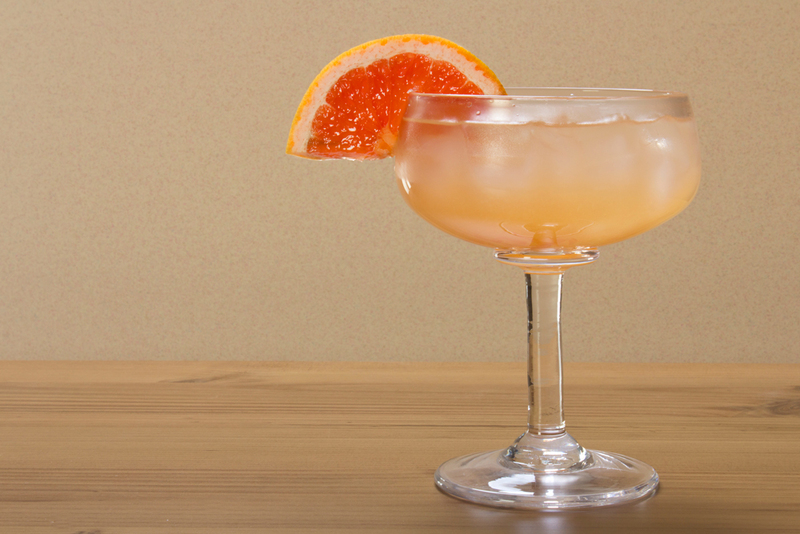 To the tequila, you add the usual suspects: lime, orange liqueur, a dash of simple syrup – and then the star of the show, fresh grapefruit juice! Served over ice in a large cocktail or margarita glass – like this Simon Pearce Woodstock Cocktail Glass – this is a refreshing, balanced, and completely delicious cocktail. In a cocktail shaker or pint glass, mix tequila, orange liqueur, lime and grapefruit juices. If you’d prefer a little sweetness, add a splash or two of simple syrup, to taste. Despite of a couple of dismal weather days over this past long weekend, and some pesky showers today, it’s shaping up to be a scorcher of a week! I don’t know about you, but when it gets hot outside, my time in the kitchen dwindles. The thought of turning on the oven has me sweating before I even begin, and I start to dream about cool, refreshing drinks. Fortunately, the assembly of this drink only requires a little bit of heat, and produces a cool, zesty, refreshing beverage to quench your thirst on even the hottest of days. And if the forecast is right, you’re going to need it soon! Unlike the other libations we’ve shared so far in our Spring 2013 Cocktail Series, this drink is virgin. You could easily add in a splash of vodka (or citrus vodka, if you prefer) and make it into an adult beverage, but if you’re just trying to hydrate, you can make it as-is. The lavender incorporated into this drink gives it a fun herbal twist, but is faint and not at all overpowering. I found the balance of lemon with lavender was perfect, and really enjoyed sipping on this! Serve in a tall glass, like this Simon Pearce Woodbury Tumbler, with a lemon slice for garnish and a sprig of lavender for some added flair. In a large saucepan, bring 32 ounces of water and the sugar to a boil. Once boiling, remove from heat, and add lavender sprigs and lemon and lime juices. Let mixture cool to room temperature, strain, and chill. Serve over ice, with additional lemon slices and lavender sprigs for garnish. Mojitos are always a winning summer drink. They’re bubbly, fresh and bright, and always refreshing. One of the best things about mojitos is that they come in many varieties – a classic mojito is always delicious, but when you add in fruits and other flavors, they can get pretty fun and creative. Shown here in a Match Pewter HighBall Glass with a Cocktail Stirrer, you can see that this cocktail makes an impression. If I made it again, I’d cut back on the berries – they kind of dominated the glass – but it sure makes for a great presentation! 1) In a chilled pint glass or cocktail shaker, muddle the simple syrup, strawberries and mint leaves together with a muddler. Crush the strawberries and mint leaves well, to release their flavors. 2) Squeeze the juice from the lime into the glass with strawberries and mint, add the rum and stir well. Transfer to your favorite cocktail glass, then fill with ice and top off with soda water. 3) Garnish with mint sprigs and/or strawberry slices, and serve! To wrap up our spring cocktail series, I have a favorite cocktail of mine to share today, the Basil Lime Gimlet. Shortly before we started working on this series, the Dinner Series team was out for an evening to bid farewell to our great, late store manager Melissa. We all headed down to Nubar at the Sheraton Commander Hotel, and once there, I ordered a Basil Lime Gimlet. Very fond of the Au Provence Gimlet at Eastern Standard, which is a beautifully balanced, slightly sweet cocktail, I was a bit taken aback when I tried the Nubar Gimlet and found it to be clean but STRONG. No sugar to be found. After a couple of sips I settled in and thoroughly enjoyed it, my mind a bit blown because I always assumed that a gimlet was made with sweetener. When I got home that night, I did some research, and found several gimlet recipes – some sweet, some not. For our rendition, I chose a recipe with a touch of simple syrup, but just enough to balance the booze and give it a really smooth taste. This is also a vodka gimlet (like the Au Provence from Eastern Standard), a bit different than the traditional gin gimlet I love so much. Still awfully tasty, and shown here in a Simon Pearce Clear Stemless Martini Glass, makes for a wonderful for presentation. This was easily my favorite creation from our Spring Cocktail Series! In a cocktail shaker, muddle 3 of the basil leaves with the simple syrup. Add the vodka, lime juice and ice, place the lid on, and shake well. Strain into a chilled martini glass and garnish with the remaining basil leaf.